Click here for Professional Bodies for Therapists accreditation. My role is to get to know you and for you to develop a greater understanding of yourself and others in a safe, confidential and supportive environment. Working at your own pace, I offer guidance and support so fresh ways of seeing yourself, the options and making choices become available. I aim to bring clarity and sensitivity to my work with warmth and humour, together with my beliefs of self-determination and responsibility. DIFFICULTY VALUING YOURSELF? 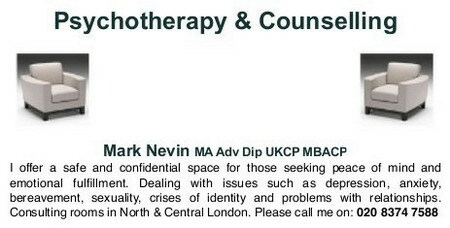 Qualified & Experienced person-centred counsellor, BAC Accredited, Camden area. Autogenic training. Short term therapy for long term effects. Self help prog / re-laxation & relief of stress. Indivs / small groups. By interculturally trained counsellor, offers one-to-one sessions, visits or other, fees negotiable.